With nine victories from their last nine matches, Birkirkara are widely fancied to carry their momentum into the New Year but coach Paul Zammit has warned of the potential pitfalls if the champions drop their guard ahead of tomorrow’s tricky clash with Floriana at the National Stadium (kick-off 16.00). “I have already had the opportunity to speak about the respect I have for this Floriana team,” Zammit told Times of Malta. “It’s not easy for any team to begin the season with the kind of handicap Floriana had but they have managed to climb up the table. Their performances and results show that Floriana are a valid team. “There’s no doubt that this is going to be a difficult game for us. “We have entered a period where the matches will become tougher... our games in January are important for us and the opposition for different purposes plus we have an important FA Trophy game against St Andrew’s. Crowned champions for the fourth time in their history last May, Birkirkara ended 2013 on a terrific note as, a combination of a 2-1 victory over title rivals Hibernians and Valletta’s 2-1 upset to Naxxar Lions, lifted them four points clear at the top. On the back of his team’s amazing run in the last three months, Zammit has good reason to be optimistic but he was quick to remind his players of their responsibility to approach every game in the right frame of mind. “We must respect the opposition but we also need to look at our qualities,” Zammit said. Birkirkara’s rivals will be hoping that the festive break has a disruptive effect on the champions’ consistency but Zammit is not unduly concerned. “When you are going through a bright spell, a break is not too advantageous,” Zammit said. “That said, this pause was for all the teams and we tried to use it to focus on certain individual details. We hope that our work will reap the desired rewards in the coming weeks. For tomorrow’s clash, Zammit must make at least one change from the last game as Brazilian forward Jhonnattann, who scored the second goal in the 2-1 win over Hibs, is suspended along with midfielder Ryan Scicluna who came on as a substitute. Daniel Zerafa is expected to miss out as he is still recovering from an abdominal problem. Floriana coach Ian Dawes is aware of the magnitude of the task awaiting his side but he’s cautiously upbeat. “This is a big game for us,” Dawes said. “We believe that we are capable of taking something from any game and this is no different. Dawes has been impressed by Birkirkara who, in his own words, “play football the right way”. 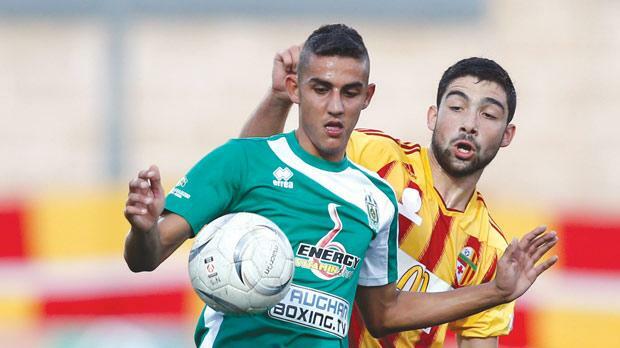 “I like Birkirkara as a side,” Dawes said. Under Dawes, Floriana have done well to stay in the hunt for a Championship Pool berth despite starting the season with a six-point handicap. The English coach believes that a positive result against Birkirkara would go a long way towards strengthening his players’ belief that they can mix it with the top guns. “We have realised that we have taken only one point, against Hibs, from our matches against the leading four teams,” Dawes said. “We need to start picking more points to show that we can compete against the top four. Nigerian defender Ibok Edet must serve a one-match ban following his red card in the 3-2 win over Rabat Ajax but otherwise Dawes has no selection problems. First round: Birkirkara vs Floriana 3-1. Rabat Ajax vs Qormi (today at 14.00, Centenary Stadium). Qormi will have high hopes of taking maximum points from their meeting with bottom side Rabat Ajax. Czech coach Karel Zeman will make his debut on the Qormi bench after taking over from Tommaso Volpi this week. Winger Leighton Grech is suspended and Brazilian forward Jorginho is recovering from a cruciate operation but all the other players are at Zeman’s disposal. The departures of two first-choice players, Clifford Gauci and Spanish forward Moises Avila-Perez, have put a further stain on Rabat’s already limited resources. Veteran forward Malcolm Licari is doubtful as he has been sick this week while Adam Smeir is still sidelined with injury. First round: Qormi vs Rabat Ajax 0-0. Vittoriosa Stars vs Naxxar Lions (today at 14.00, Hibs Stadium). The two promoted sides head into their second-round duel in buoyant mood after winning their last game. Naxxar Lions produced a shock after beating title contenders Valletta 2-1 while Vittoriosa Stars ended a run of five consecutive defeats with a 2-1 win over Qormi. Filipe Aguiar, Vittoriosa’s Portuguese midfielder, must skip the match after receiving a one-match ban following his red card in the Qormi game. Coach Oliver Spiteri could give a debut to Italian forward Federico Santaguida who joined the Cottonera side after leaving Qormi. Naxxar Lions coach Winston Muscat has lost Brazilian midfielder Andre Rocha da Silva to suspension. Ousseni Zongo and Louis Cutajar are no longer part of Naxxar’s squad. Kurt Drago, who has just recovered from injury, could miss out due to illness. Argentine defender David Alejandro Reano was expected to arrive yesterday but will not be involved in today’s game. First round: Vittoriosa vs Naxxar 1-1. Sliema Wanderers vs Mosta (today at 16.00, Centenary Stadium). Sliema Wanderers and Mosta will be aiming to get back to winning ways. In their last outings before the Christmas interlude, Sliema disappointed in a goalless draw with Tarxien Rainbows while Mosta crashed to a 2-0 defeat to fellow top-six hopefuls Balzan. Alfonso Greco, the Sliema coach, is upbeat about Mark Scerri’s chances of starting the game after the midfielder was forced to come off in the first half of the Tarxien game following a clash of heads with Andrew Agius. Sliema have signed a new foreigner, Admir Vladavic, but at the time of writing, the Bosnia midfielder’s international clearance had not arrived. Enrico Piccioni will take charge of his first game since replacing Danilo Doncic as Mosta coach. Winger Dyson Falzon is also set to make his debut for Mosta after rejoining the club on loan from Valletta. Brazilian forward Diego Pereira is still recuperating from knee surgery. First round: Mosta vs Sliema 3-2. Valletta vs Tarxien Rainbows (today at 16.00, Hibs Stadium). Mark Miller’s task to steer Valletta back to winning form has been made more complicated by injuries and suspensions. Captain Ryan Fenech and defender Steve Borg are ruled out with suspension while Jonathan Caruana, another defender, is out with an adductor problem. Miller is also hampered by the absences of English striker Latif Elford-Alliyu, injured, and Gambian forward Aziz Corr Nyang who has yet to return from Sweden. Belgian defender Jason Lee Vandelannoite, back in the squad after completing a 28-day ban, could be in line for a first-team recall as City look to bounce back from their upset to Naxxar Lions. Tarxien coach Clive Mizzi also has several selection problems. Defender Steven Bonnici and Brazilian forward Ronaille are suspended, Luca Martinelli and Ryan Sammut are injured and Steve Sadowski is highly doubtful after being down with influenza. Brazilian forward Everton Souza Santos has been released by Tarxien who were yesterday trying to complete the signing of Norwegian defender Kai Risholt who has left Żejtun Corinthians. Risholt started the season with Balzan. First round: Valletta vs Tarxien 3-0. Balzan vs Hibernians (tomorrow at 14.00, National Stadium). Now six points behind Birkirkara, Hibernians need a win to keep the pace with the front-runners. For their part, Balzan are also chasing the three points to keep their Championship Pool hopes alive. Hibs coach Branko Nisevic hopes to get the all-clear to field Brazilian defender Rodolfo Soares who has been struggling with a shoulder injury sustained in the 2-1 defeat to Birkirkara. Johann Bezzina is still out of the picture due to an abdominal injury but the young midfielder is expected to resume training next week. Defender Matthew Tabone has joined St George’s on loan until the end of the season. Balzan have been very busy in the transfer market. Yesterday, they concluded the loan signing of goalkeeper Manuel Bartolo from Valletta. Kurt Magro, also signed on loan from the Citizens, Brazilian defender Ramon, who was with Vittoriosa Stars, and Chilean midfielder Edison Bilbao Zarate, who played for Qormi last season, could make their debut for Balzan tomorrow. Pedrinho, who has rejoined the Reds after a short spell in Thailand, may have to wait for his debut as, until yesterday evening, Balzan were still waiting for his international transfer certificate. First round: Hibernians vs Balzan 1-0.